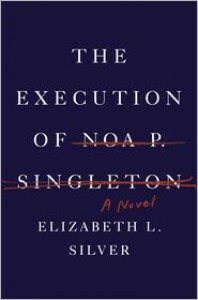 Elizabeth Silver's debut novel opens with the introduction of Noa P. Singleton waiting on death row in a Pennsylvania prison, six months prior to her scheduled execution. Ten years after her original trial and with little hope of an appeal, Noa has accepted her fate when she is unexpectedly visited by powerful lawyer Marlene Dixon. With a sudden change of heart, Marlene, the mother of Noa's victim, has decided to work toward a clemency petition. As Noa's execution date nears, she attempts to piece together her past to figure out who her changing circumstances will benefit and if she truly deserves forgiveness. As I started reading The Execution of Noa P. Singleton, I was quickly distracted by the flowery style of Silver's writing. With strings of mismatched words, often interrupted by afterthoughts in parentheses, I felt more like Noa was writing a college admissions letter than introducing readers to her story. However, as Noa begins to detail her past, she takes on a lighter, more narrative tone that is easier to digest. Silver is quite adept at leading readers down unexpected paths and into unforeseen moral dilemmas. What I thought might be a simple examination of the American criminal justice system was actually a novel that kept me guessing to the very end. The Execution of Noa P. Singleton is a well researched, smart look at the perils of capital punishment with just enough suspense to keep readers on edge.